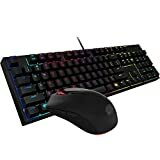 The choice of our new gaming keyboard is essential, especially if we are PC gamers who prefer keyboard and mouse instead of the classic joystick. It is one of the fundamental peripherals, which allows us to play in comfort, getting the best performance without suffering from input lag. In this guide, we will see, which are the best gaming keyboard divided by price range. We will also analyze all the features and all the aspects that are crucial for the choice of an excellent keyboard that will accompany us over the years. On the current market, there are a myriad of gaming keyboards. Some are really good, others are passed off for peripherals dedicated to gaming only because they have some RGB LEDs. For this reason, it is important to analyze some features that allow us to bring home a great product. The keyboards that we’re going to see in this guide, as well as being compatible with Windows, are also gaming keyboard for Mac. It is said that a good mechanical keyboard is also a good gaming keyboard. The first distinction to do concerns the type of keys present, which can be membrane, mechanical or mem-chanical, or membrane-mechanical hybrids. Keypads with membrane keys are very cheap, but do not guarantee an optimal response time like that of mechanical keyboards. However, those of excellent workmanship, like those of Logitech and Cooler Master, defend themselves very well. Mechanical keyboards are much more expensive, but guarantee unrivaled accuracy and response time. Furthermore, in the event of a malfunction, simply replace the faulty key, without having to replace the entire keypad. However, a good mechanical keyboard for writing may not be as effective in the video game field. The mem-chanical keys, on the other hand, are hybrid keys, which mount a membrane as a sensor, while they have the same mechanism for actuating the mechanical keys. Keypads with hybrid keys are cheap, but guarantee a better response than the classic membrane ones. In short, they offer a good compromise between the two types seen previously. If we decide to opt for a mechanical keyboard, we must also consider the choice of switches. There are different types of switches and each has different characteristics that can satisfy the tastes of each gamer. They require a certain actuation force to be crushed, a predetermined stroke to switch from the rest state to the point where the signal is sent and an auditory feedback that varies according to the return system of the key. Many manufacturers, such as Logitech and Razer, prefer to adopt switches with a proprietary structure. Most manufacturers prefer to adopt the switches produced by Cherry. The Cherry MX series is the most famous in the world of mechanical keyboards and one of its best-known variants is the Cherry MX Red. The choice of the type of switch depends exclusively on our needs. A good gaming keyboard must be able to guarantee excellent ergonomics, so that you do not get tired during the game sessions. For this reason, many of the mid-high-end keyboards include handy wrist rest in the package. Finally, there are some secondary characteristics that are strictly personal. Such as the presence or absence of programmable macro keys, or the ability to connect peripherals, such as mouse and headphones, directly to the keyboard. Furthermore, another purely personal aspect is the appearance and the materials with which it is made, such as plastic or aluminum. In this price range, there are membrane keyboards that are distinguished by the excellent quality/price ratio. Obviously, we cannot expect high-level devices in this section. However, if we are not demanding gamers, we can opt for one of the following keyboards. It is one of the most famous kits for those approaching the world of gaming keyboards. The strong point of this keyboard is the excellent quality/price ratio. A mouse is also bundled. It has convenient buttons dedicated to manage volume and the music player. Being a membrane keyboard, it is characterized by a long stroke, but despite this the keys are quite sensitive. It is also equipped with blue LED backlighting. There are no programmable keys and inputs for other devices. It is a membrane keyboard with a 2-meter twisted nylon cable and dedicated multimedia buttons. It offers a really good level of comfort, thanks to the quite spacious palm rest. The keyboard is very robust and is also resistant to falling liquids. The F1 to F12 keys can be customized, for a total of 12 programmable macro keys. The keys are well-made and offer a good result both in gaming and writing. It is a valid choice among the entry-level gaming keyboards currently on the market. The backlighting provides only two colors, namely red and blue. In this price range, there are models that offer some more features than those seen previously. In addition, there are also cheap mechanical gaming keyboards. So let’s see what are the best mid-range gaming keyboard. It is one of the best keyboards for quality/price ratio. 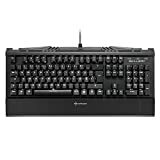 It has the mem-chanical hybrid keys proprietary to Cooler Master, which offer tactile feedback that is similar to that of mechanical keyboards. The keys have a good response and behave very well during the gaming sessions. The build quality is above average, and the supports located below the keyboard allow you to attach it to your desk. It too is bundled with a poor-quality mouse. However, it is also possible to purchase it individually. It also enjoys an RGB lighting with many effects that can be changed by certain key combinations. You can change the type of effect, speed and direction. So there is no software that allows you to change RGB lighting or customize specific keys. It is one of the best keyboards with mem-chanical keys currently on the market. It is suitable for both gaming and everyday use. There is a comfortable, non-removable integrated wrist rest, which guarantees excellent comfort during use. In addition to the multimedia keys, you can customize the F1-F12 keys as macro keys thanks to the keyboard management software. It also enjoys resistance against possible drops of liquids. There is a 16.8 million color RGB lighting with effects that can be synchronized with other Logitech devices. This is a membrane gaming keyboard made by Corsair. The keys are made very well and offer excellent feedback, both tactile and auditory. There are comfortable buttons that allow you to manage the audio. It is also equipped with 6 macro keys programmable through particular combinations of keys. Unfortunately, there is no software that allows you to manage RGB lighting and customizable keys. In the package, there is also a comfortable palm rest that we can decide to use or not. Unfortunately, it does not have USB ports and audio jacks to connect other devices. In this price range, we also wanted to include this mechanical keyboard from Sharkoon. 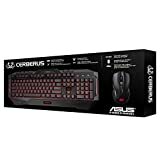 This is an excellent mechanical keyboard with an excellent quality/price ratio. It is equipped with Kailh Blue switches, an economic alternative to the well-known Cherry MX. Despite being equipped with a numeric keypad, it looks like a compact keyboard, made of metal at the top and plastic at the bottom. Each button is equipped with RGB LED that can reproduce up to 16.8 million colors. Now we come to the last section dedicated to gaming keyboards, or the high-end ones. In this section, there are the best mechanical keyboards currently on the market. Obviously, the price will be a bit high being high-level peripherals. 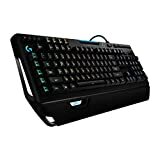 This is a keyboard that mounts the Romer G mechanical keys, developed directly by Logitech. The 1.5 mm drive allows you to receive inputs up to 25% faster than your rivals, with the ability to withstand over 70 million key presses. Thanks to Arx Control we can connect smartphones and tablets, displaying game information and system statistics. The keyboard is very customizable. We find the possibility to customize 9 macro keys and the possibility to manage the RGB 16.8 million color lighting entirely, which can be managed using the PC software. In addition, there is also a comfortable integrated wrist rest, not removable. Definitely one of the best gaming peripherals currently on the market. Made entirely of metal, this Razer BlackWidow X Chroma offers maximum performance even in the most extreme gaming sessions. The excellent mechanical switches owned by Razer are an excellent alternative to the well-known Cherry MX. Anti-ghosting allows you to press up to 10 keys simultaneously. Chroma lighting of 16.8 million colors allows you to customize the lighting of every single key. Obviously, it is a gaming keyboard compatible with Mac. It is one of the best mechanical keyboards made by Corsair. The Strafe RGB features the popular Cherry MX switches in Brown, Red or Silent. The switches guarantee maximum performance and durability. It offers 100% anti-ghosting, ensuring maximum accuracy even in the most intense gaming sessions. The FPS and MOBA kits of textured and shaped keys guarantee an excellent grip and a pleasant sensation to the touch. The CUE software allows you to customize each individual key and manage the RGB lighting of the keyboard. In addition to the comfortable removable palm rest, we also find a useful USB pass-through that allows us to connect external devices directly to the keyboard.